It depends on extensibility, set-up, access & style. Actuate performs fairly well, but has performance issues because it sits on top of eclipse, which sits on top of Java. Extensibility usually comes at that price. Set-up is fairly straightforward and it can be secured. There are great boards and blogs for developers and engineers to expand and use their features. The people from the company that I've worked with are professional and courteous. It is a very user-friendly platform that allows individuals without IT backgrounds to build models in simple syntax. If you know how to use Excel, you will be able to pick up model building in Anaplan with relative ease using the guided build methodology. Anaplan is a blank slate that allows for multi-dimension models in which we determine the dimensions versus forcing us to adhere to predetermined dimensions. Maintaining our company hierarchies in data hub allows us to change information there and have it automatically pushed out to all spoke models versus changing 10-20 spreadsheets. The dashboard functionality is basic therefore, we have to bring in Tableau to provide a more professional view of the outputs as well as to allow management to more easily slice and dice data. There is an Anaplan learning center however, I have not found it useful when I have questions. We are fortunate to have Aviana Global guiding us through the initial phases of our process. Without our consultants, learning Anaplan would be overwhelming. The Anaplan Connect needs to be improved. 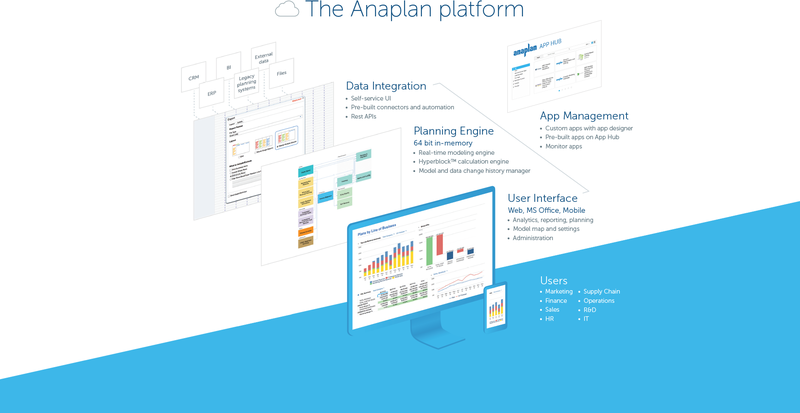 We are considering a third party ETL, but we prefer that Anaplan have this capability built into its platform. Always there on the front and backend for us and the client. Actuate has a HUGE number of features that can tie nicely into almost any ERP but it takes some time to learn and the development community was relatively small compared to the Crystal Reports alternative. Crystal was far easier to learn and had a massive support base. Probably because it is now owned by SAP. Actuate can handle 50 to 60 sub reports inside a report very well. Dynamically creating the datasource, chart, graph, reports are the main advantages. We can do any level of drilling, and can create a performance matrix dashboard efficiently. I'm sure the impact is positive. We have streamlined many processes and created capacity for our finance team. It's great to have "one source of truth" and know that everyone is looking at the same metrics.